Kyu Sakamoto was the first, and the last. It was 1963, the year before Tokyo hosted the Summer Olympics, when the pearly-toothed crooner rocketed to the top of the US Billboard Hot 100 singles chart with his toe-tapping ditty ‘Ue o Muite Aruko’, better known to Western audiences as ‘Sukiyaki’. To this day, he’s still the only Japanese artist to have scored a number one hit in the US. So when a trio of Japanese high-school girls reached number 187 on the Billboard 200 album chart earlier this year, it may not have seemed quite so spectacular an achievement. But the recent success of Babymetal is, in fact, pretty unusual. Consider this: in the past 30 years, only five other Japanese artists have managed to crack the Billboard 200 – and one of them was ghastly New Age cheeseball Kitaro. That’s not to say to say that other Japanese musicians are complete unknowns; rather, as Spinal Tap’s manager might have put it, their appeal is ‘more selective’. Mainstream J-pop acts can always rely on a solid following in East and Southeast Asian countries, where listeners are more attuned to the melodies and styles favoured by Japan’s hit makers. But in Europe or America, most Japanese music fails to find an audience unless it’s appealing to a specific niche – or unless it’s very, very odd. 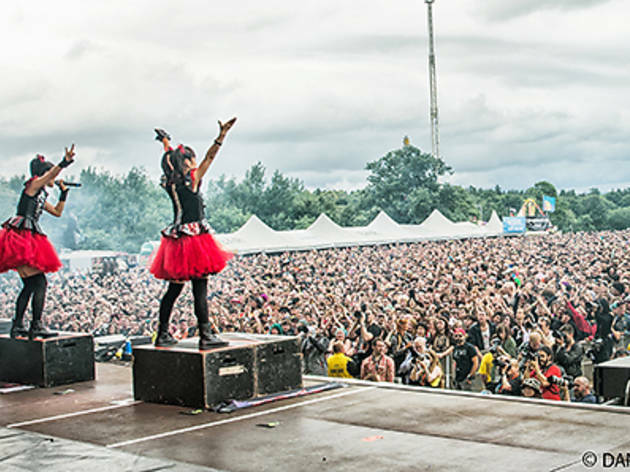 Babymetal ticks both boxes, which might explain why they’ve garnered more international media buzz in the past year than the rest of the J-pop industry combined. Their unlikely blend of sugary idol pop and moshpit-ready heavy metal was enough to guarantee them instant internet meme status. However, when it became clear that the group’s live support band could shred like Slayer – and that their eponymous debut supplied some of the most joyously absurd headbanger anthems since Andrew WK’s ‘I Get Wet’ – even the most cynical observers started to come around. 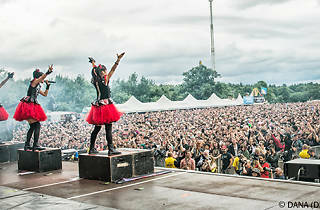 Of course, it also helps that Babymetal aren’t megastars in Japan – or at least, not yet. The entertainment industry here imposes voracious demands on the more successful pop artists: a hit singer usually spends their working hours caught in an endless whirl of variety shows, TV dramas, films, radio spots, fashion shoots and commercials. When Kyary Pamyu Pamyu embarked on her four-continent Nanda Collection World Tour earlier this year, it was hard to believe that the 21-year-old starlet had managed to find the time for it. Ah, Kyary. In the three years since releasing her debut single, the one-time Harajuku fashion blogger has risen from cult pop sensation to become one of Japan’s hottest commercial properties – all (thankfully) without having to rein in her sartorial excesses. It’s her image as much as her music that helped Kyary gain an international following: every new video feels like plunging deeper down the rabbit hole, into a lysergic, day-glo fantasia populated by singing onions, dancing robots and creepy dudes in animal masks. Her visual aesthetic is so strong and so consistent that you can ‘get’ Kyary without needing to understand what she’s singing about. This consistency extends to the music itself; though there’s been talk online about Kyary collaborating with UK beatmaker Sophie and French pop band Yelle, to date her entire discography has been the work of one man, Yasutaka Nakata. The producer wunderkind, hitherto best known for turning Perfume into one of the country’s biggest – and certainly its most adventurous – J-pop acts, favours a maximalist electro that sounds naggingly familiar to Western ears, while incorporating enough off-kilter twists to keep it from becoming openly derivative. Not coincidentally, Perfume have also enjoyed a measure of overseas success themselves. Like Kyary, they’ve managed to maintain a coherent visual and sonic signature across multiple albums, with help from a creative team that includes avant-garde choreographer Mikiko Mizuno and programmer/visual artist Daito Manabe, who makes the dazzling projection mapping used in the group’s live shows. Yet for years, Perfume’s rise was stymied by a domestic record label that apparently couldn’t care less about cultivating a worldwide audience. Only when they signed to Universal Music Japan in 2012 did the trio’s music become available on iTunes overseas. The latter point is worth bearing in mind when you consider the relative fortunes of Japanese acts in the international market. Try searching for Arashi, AKB48 or Uverworld on iTunes in countries other than Japan – you won’t find them. Major labels here still regard the internet with suspicion, especially the parts of it that don’t speak Japanese (or, ahem, don’t let them charge ludicrously inflated rates for MP3 downloads). By contrast, when Babymetal and Kyary went viral, their albums were ready and waiting in the iTunes Store – and not just the Japanese one. That’s true of a lot of the other Japanese acts who’ve been getting attention in the West, whether it’s electrocore quintet Crossfaith (recently seen playing the main stage at the UK’s Reading and Leeds Festivals), austere motorik-rock trio Nisennenmondai (who appeared at this year’s Sónar in Barcelona) or dubstep producer Goth-Trad (an annual fixture at Croatia’s Outlook Festival). Stadium-sized guitar band One Ok Rock – a highlight of this year’s Vans Warped Tour in the US – may have been prominently featured in the soundtracks of the ‘Rurouni Kenshin’ movies, but they also had the good sense to make their albums available on iTunes overseas. Because c’mon, how else are you going to build a fanbase? Returning to the example of Babymetal (sorry, they are rather special): the group also had the good fortune to tap into an audience that’s historically been very accepting of bands from Japan. Remember those five other Japanese artists who’ve cracked the Billboard 200 in the past 30 years? Three were bona fide heavy metal groups: ’80s warhorses Loudness and Ezo, and latter-day alt-metal titans Dir En Grey. When it comes to headbanging, apparently, it doesn’t matter what language people speak – as long as they speak the language of rawk.